This timely and evocative issue of Rheumatic Disease Clinics explores important current and controversial topics in the treatment of osteoporosis. And it answers some tough questions! Here are some examples. How long do I treat my patient? Is there a place for bone turnover markers? How much Vitamin D should I recommend? Controversies around calcium and Vitamin D are explored regarding the coronary risk and pancreatic issues. Emerging therapies are presented, including sclerostin and oral calcitonin. Long-term safety concerns of antiresporptive therapy (ONJ, atypical fracture, would healing) are explained. The utility and limitations of FRAX are covered, as well as Prolia and the RANKL pathway. An update on glucocorticoid induced OP is given. The reader is also brought up to date on men’s health issues and OP. 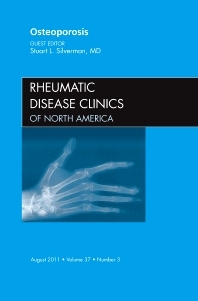 This is an essential issue for any practicing rheumatologist to stay current in the field.